Several weekends ago, the Miami Dolphins had their first regular season game, and the homecoming could not have been more rewarding for the team after weeks away from home. In the aftermath and recovery from Hurricane Irma, the team's first home game was rescheduled to later this season, and earlier in the season the team traveled across the pond to London, where they took on the Saints as part of the NFL's London Games. Along the way, the Miami Dolphins Cheerleaders patiently waited to debut their new signature uniforms this season. Now the team is back on home turf, and looking better than ever! Planning for this year's new season and new look began well before the preseason in March with design sketches. The team had been wearing their two piece uniform for several years. So something new was definitely in order! 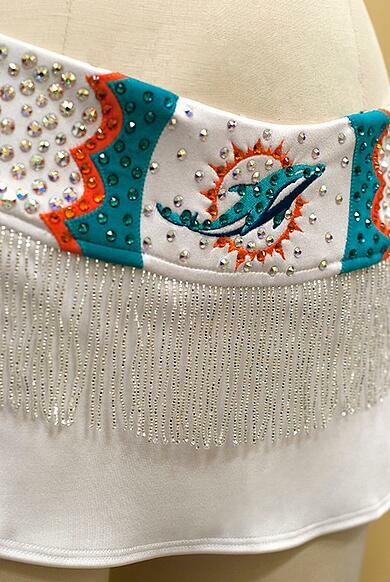 Dorie Grogan, the Director of Entertainment at the Dolphins, wanted new cheer uniforms that gave the team an up-to-date style that still maintained their current brand. "They wanted a fresh look without reinventing everything," explained Deb, Creative Director at The Line Up. "It needed to look new but also in character with their old uniform." To achieve this, the Dolphins maintained a few key elements: an all-white base, their signature collar, a sunburst neckline, and the cut of their fringe skirt which they loved. The look was important for the team to get right, and Dorie oversaw the process the entire way to make sure it met the team's requirements. This took multiple sample garments to achieve the final, polished look - three prototypes in all! One of the challenges from a design and patterning perspective was: "trying to get the collar right - something that was flattering yet draped properly," said Deb. The team felt this was an important element to maintain from their previous uniform, and adding a new silhouette required extra attention. The new cheer uniform incorporated a lot of detailed embellishments as well. An applique sunburst at the neckline plus embroidered logos displayed the teams brand. Delicate beaded fringe on the skirt added movement. And over 600 rhinestones were used to add that must-have sparkle on the field! In the end, the result is another fabulous look for the team, one that they can maintain for years to come!